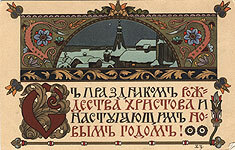 Russian Christmas Cards in the Collections of the NLR. Since the inception of postcards, they, of course, were used for greetings, because they could quickly bring words of holiday cheer to loved ones. The Christmas and New Year's greeting cards have housed at the Prints Department of the National Library since the early 20th century. In addition to Russia's postcards, the department stores publications printed abroad, but for the Russian market. They include items, dispersed throughout the general holdings of the Prints Department, as well as a small collection formed by Alexander Pronin (1927-2007). Professor of Russian language Pronin, a collector of materials on Russian and Soviet history and culture, donated it to the NLR in 1997. The Pronin collection, consisting of about 500 postcards, was trasferred from the American California Library named after Henry Madden. This collection, for example, contains a card produced after Boris Zworykin (1872-1942)'s drawing by a major Stockholm publishing house – Granberg's Joint-stock Company. Zworykin is a graphic artist and book illustrator, who is also known as an author of church wall paintings and icons. 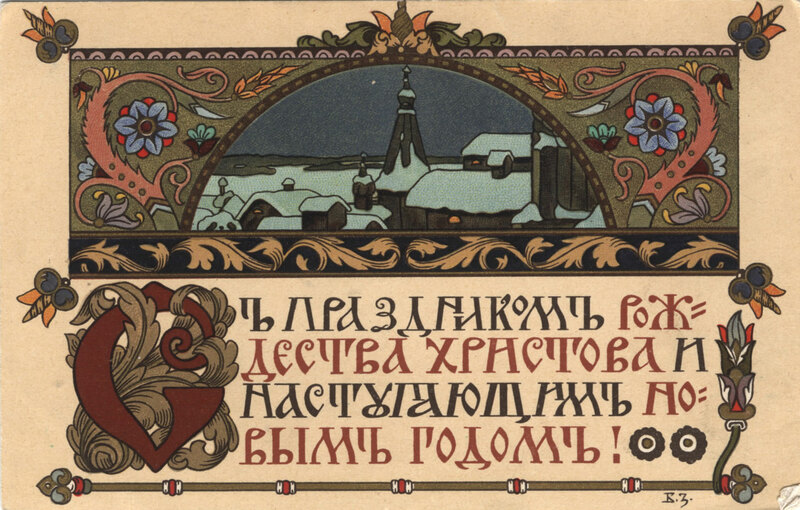 In the postcard, he combined a winter landscape with an ornamental and font composition, forming an expressive imitation of an ancient manuscript miniature. Merry Christmas and Happy New Year! : Postcard - Stockholm: Granberg's Joint stock company, [between 1904 and 1916]. - Chromolithograph ; 8,9х14 cm.